Back in Summer 1981 some girls came to visit Sligo from Northern Ireland and we hung around with them for a while. We were seventeen, it seemed like a good idea at the time. One of our guys (who’d better remain nameless in case he’s lurking like Sean was - (see comment in previous post)) actually fell head over heels for one of the girls for the sole reason that he helped her to get sick in a wash basin one fine evening. Well, physical contact was at something of a premium back then. Look, here’s the point – these girls had seen a film, up in Northern Ireland, which we hadn’t even got to hear about yet. "Wait ‘til you see it," they said, "And wait ‘til you see the first ten minutes, you won’t bloody believe it." My relationship with the individual Indiana Jones movies has revised itself a bit over the years. My great affection for the first has never changed and revisiting it on the big screen can revive the most jaded of B Movie palettes. I loved the second when it first came out and I was very disappointed with the third. This view on numbers two and three has now been completely reversed. ‘Temple of Doom’ is shallow and weak in narrative – although the opening sequence is still great. ‘Last Crusade’ has an opening that is a bit-of-a-dud, in my opinion, but the movie itself is warm and adventuresome. So last night, our little nuclear family went to see the new one – Indiana Jones and the Kingdom of the Crystal Skull. I wanted to like it and so I did. There is much in it to be thankful for. Thanks that Harrison Ford is not required to play younger than he is. Thanks that Karen Allen has some back to Indie and to us. Thanks that period detail and wry humour can still be accommodated. I rushed to see it before all the reviews and the clips and the opinion and the interviews coloured my view of what I was seeing and I strongly recommend that you do the same. Even the small amount of hype which I have exposed myself to, since seeing it, has already started to convince me what I should think of it. I hate that – I know what I think of it, I bloody saw it didn’t I? Downside? There is a 30 minute section in the first hour that drags quite remarkably. There’s a lot of plot-exposition to get through. Also - I know there’s a lot of talk about this – some of the CGI special effects seems a little intrusive but then I recall that the matte work in Temple of Doom seemed very intrusive too. Once that slow bit gets done – it’s all systems go. Before I saw it, I didn’t actually know what this movie was ‘about’ – I mean in the same way that the first was about the Arc of the Covenant or the Third was about The Holy Grail. Had I known what it was about, a whole other set of prejudices would have emerged in me before I saw it. You will probably get to hear what it is about before you see it (no, I won’t tell you). How you deal with that information is entirely up to you. Will you like the new movie? The answer to that is simple. If you go to it expecting to enjoy it, then you will. All the necessary elements are there, knock yourself out. On the other hand, if you go expecting to be disappointed, then you will be. There is enough there to be disappointed about, if that’s what rocks your boat. 'Want my advice? Put your best happy face on and get your arse down to your nearest movie-drome. They still make ‘em like they used to. Ken, thanks for your non-specific review! You hit just the right note on this! I've heard great things and disappointing things about the movie. I had planned on seeing it a couple nights ago, but then my hopes were deflated by all the naysayers who had seen it before I.
I had the same reaction to Jurassic Park when it first came out. All I could do was make the comparison to the book and be critical of all the things that were not right with the movie. The second time I saw it, I actually enjoyed it because my expectations had been significantly lowered, although I was still ga-ga over the groundbreaking special effects. Now I promise you I'll see Indiana Jones with the proper mindset later this week. I'll get back to you with my impressions. But they'll certainly be more positive now than had I seen the movie with all the expectation not tempered by my mood. I've not seen it yet so I can't comment on that but I know how I felt waiting for the first Batman movie, the Tim Burton version. I had known it was coming for years and had read every scrap of information I could about it and I was there on the first day and there was NO WAY I wasn't going to be disappointed because NOTHING could have lived up to the picture I had in my head. Nowadays I make sure I read next to nothing about the films I'm desperate to see. 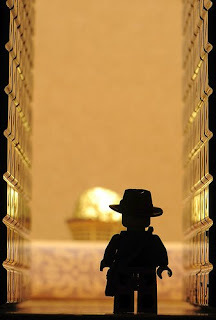 I was fascinated with the first series of the Indiana Jones movies. Perhaps because Harrison Ford was much younger then(grins). But going to a movie means enjoying yourself or you would have paid for nothing; so you're right that one must expect to enjoy it. There are instances in which I have read the book,(like , "Where Eagles Dare" )and I don't expect the movie to be as good as the book. The book delves deeper into the characters of the story. Either way; however, I still enjoy the movie as my expectations are not way off. I may just take your advice. I haven't been to the movies for yonks, so I won't be expecting - I forget what to expect! Ken, if I ever sell one of my scripts I want YOU to do the first review. I loved this, mostly cause I think just like you do. How I expect to see a movie is how I think I end up seeing it. BTW, I used to work in a stereo store and we had the first Indiana Jones movie on a loop. It got better the more I saw. Sort of taught me (by osmosis) how to watch and write a movie. Took your advice. Paid no heed to reviews (didn't read or listen to them), saw the show on Monday night. Pretty much as you said - a bit too much CGI, some rather lengthy spells that were unnecessary, not as much fun as I would have expected. The artistic vision that created those ancient worlds was fantastic! I think this hyped up expectation is what spoiled the third instalment for me. I didn't like the start then sat thru the rest with a face like a slapped arse on me. This 'I want to enjoy it, so I'm going to enjoy it lark' doesn't always work but it's worth a try. Plot dog - you are on! I am now resolved to enjoy your next movie! My daughter wasn't impressed with this one, but I still want to go see Indy. Afterall, he lives in our state of Wyoming--up in Jacksonhole, north of us.